Honey colored calcite formed in the Giant Venus Clam fossil (aka Mercenaria permagna) of the Fort Drum Member, Nashua Formation of Florida. It was described by Conrad in 1838 and can also be found in North and South Carolina. This creature lived in the Calabrian Stage (780,000 years ago to 1.8 million years ago) of the Pleistocene Epoch of the Quaternary period. 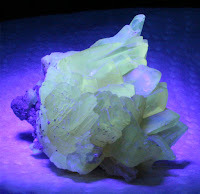 The fluorescent color and intensity of this specimen reminds me of calcite long wave fluorescence of Harz, Germany. 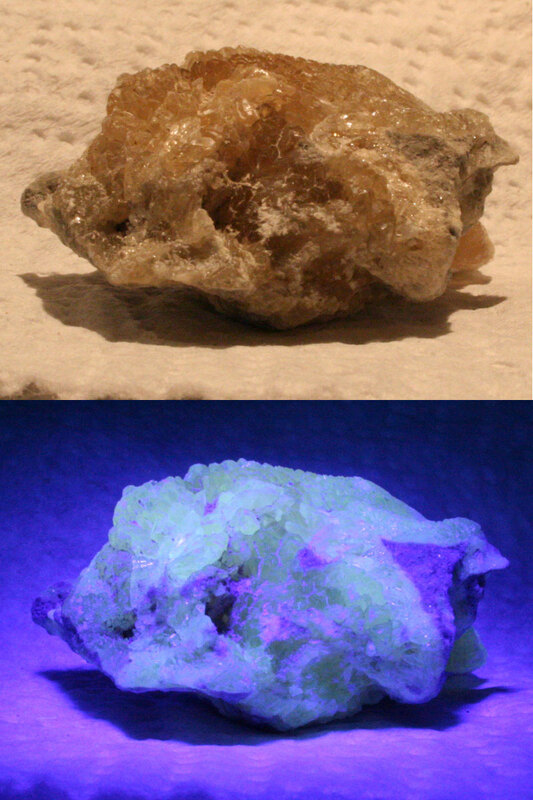 An interesting property of this calcite is that it will fluorescence in ultraviolet (UV) light. The calcite shown in this post was illuminated with 395 nm light showing a bright yellow response. Second fragment shown in image below. 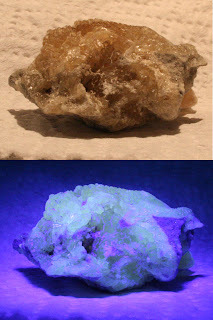 Hopefully, I will soon acquire a short-wave uv light (254 nm) and study the calcite response to that particular wavelength. Thanks to Mary Ann for the fossil specimen!